yesterday morning, i got an invitation to a golden globes party (in los angeles) for children. while i'm all too familiar with the weird science of blast lists after my year of sadness in PR, it's still kind of fascinating to me that someone somewhere felt that i would generate a media hit for their client. if i had a definitive beat, and lived on the west coast, and didn't fear wee ones, i suppose i'd be tempted to go, if only to give my handler a break for the afternoon. * as is, i'm just happy to be on the other end of the pitch. 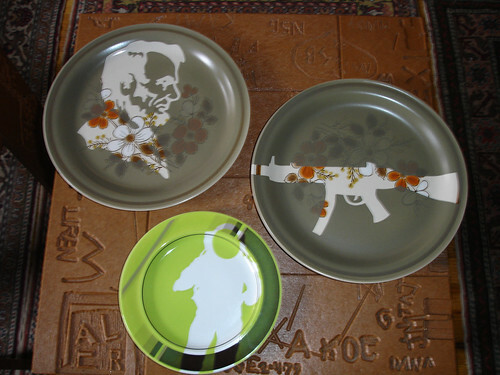 joe recognized the background on the larger two - his late grandmother had dishes with that pattern. lincoln doesn't really add to our cold war kitchen theme, nor does the moose design (our fourth request - when picking the set, we told sarah which colors and motifs we fancied), but the ensemble is just what we wanted. get yer china from sarah cihat, everyone! she rocks! on a far sadder note, the o.c. finally bit the dust. it's no surprise - mischa barton knew she was fleeing a sinking ship when she took off for the big (cough) screen last year, as did most mischawatchers - but it's a loss. joe considers peter gallagher's eyebrows his honorary mentors, and (like ryan) i was developing feelings for taylor townsend (even though autumn reeser is an unabashed - gulp - scrapbooker). oh, post-marissa show. you were too pleasant for this cruel world. *that's no small thing: working industry parties is like hooking and zookeeping at the same time. i truly admire your distinct, unique tastes. mine is a muddled, store bought variety, united by the motif of cat fur & dust. ah, yes, i should have realized long ago that the design reins should be in josh's hands, not mine. indeed! that's hardly fair - hell, i say cat fur and dust augment one's stuff (at least i hope they do). * jason miller, the guy who made our graffiti tables, made a series of dusty tables that already look as if they've been sitting around for years (i covet them, actually, and his duct tape chair - but our cats can turn a $500 piece of furniture into a $50 piece in ten seconds flat. also, of course, we have no money and/or room). *and you've got a lovely sense of style, s.